After a few months out of the limelight, Marvel's resident vampire hunter, Blade, is back in the game, this time playing a supporting role in the latest X-Men crossover. With the recent appearance of daywalking vampires and the assassination of bloodsucking kingpin Dracula, it's been a time of sudden revelation for this sword-wielding half-breed. Hunting vamps has suddenly become twice as dangerous and unpredictable, with a recent rash of dead hunters only serving to reinforce that fact. With a setup like that one and a looming tie-in to one of the publisher's premiere titles, the stage would seem to be set for some serious fireworks in this one-shot. Or rather, one might think it would be. 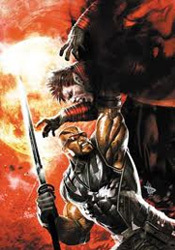 In practice, this issue serves little purpose beyond reintroducing the audience to the rules of Blade's world, sharing a few graphic slayings and giving the lead a reason to take his show to San Francisco in search of Scott Summers and friends. Even as someone who's never been all that familiar with this character's adventures, I noticed several moments where it felt like the information I was getting was more than a little redundant. Duane Swierczynski's writing is a strange concoction, blending a grizzled noir detective's narration with a hardass action hero's behavior. The idea was to give Blade some extra depth, to prove there's more to him than stakes, bad hair and machismo, but in practice it just feels like the narrative is spoken from another player's perspective. Blade pulls the trigger, postures and fires off terse one-liners, then Humphrey Bogart comes in for a scene-shifting voiceover or to describe a new character. As the page count begins to add up, Swierczynski tries to cover for his issue's deliberate pace with a few gory pages of action and brutality, but it doesn't work particularly well. When the dust clears, the plot has gone almost nowhere and the dead are relegated to the handful of disposable no-names we'd met just a few pages earlier. Tim Green's loose, light artistic touch is an awkward match for the mood Swierczynski is trying to set in the plot – while the story's trying to provide a tense, horror-tinted atmosphere, the artwork never feels entirely serious. Green's visuals are quirky and energetic from start to finish, and they do show some signs of rush in the final pages. I actually enjoyed the majority of his compositions, but it's a terrible choice for this kind of story, which would have been better suited for the deep, dark, somewhat dated style provided by Dave Wilkins on the cover. It's like Darrick Robertson teaming up with Neil Gaiman, though neither Blade contributor deserves that comparison: two creators headed in such precisely opposite directions that they directly cancel each other out. A mismatch at best, a disaster at worst. Blade's edition of Curse of the Mutants spends more time treading water than it does in the thick of things, avoiding the meat of the subject so that the bigger books have more to chew on when they finally get around to it. It's far from essential reading, especially considering the entire thing is summed up in a few word balloons when Blade finally arrives in San Francisco within X-Men #2. Skip it.